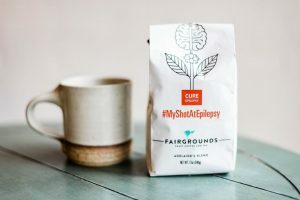 CURE is proud to partner with Fairgrounds Coffee, the creators of Adelaide’s Blend coffee, to raise funds for epilepsy research. Adelaide’s Blend is named in honor of Adelaide Cervantes, daughter of HAMILTON Chicago star Miguel Cervantes and CURE board member Kelly Cervantes. Adelaide has infantile spasms, a rare and severe form of epilepsy. You can purchase Adelaide’s Blend in-store to help fund cutting-edge epilepsy research at Fairgrounds Coffee, Mariano’s, or online here.